Tactical weapon for fighting red cells – We have moved – Follow us on www.telestehub.com! With HD video and new streaming services, consumer demand for more bandwidth seems to know no bounds. Upgrading networks to meet the demands is becoming more and more expensive, and sometimes the costs are too high to justify new investments. Operators are seeking economically viable solutions to increase network capacity where it is most needed. The demand for more bandwidth seems to follow Moore’s law, as network traffic is doubling every 18 months. The main culprits for the increasing bandwidth demands are video streaming services, new HD video formats and the fact that there is simply far more video content available and more screens for using that content. The ultimate answer for meeting future bandwidth demands lies in FttH. However, the journey to FttH will take some time because FttH is far too expensive in almost all scenarios, except for in completely new buildings and newly built areas. This is especially true in Europe, where the majority of buildings are old. The question is, what can operators do now and what is the best path towards FttH? The traditional way of increasing network capacity has been to segment the network into smaller units. Segmenting works very well in networks with large cell sizes, but the approach has its limits. When network segment sizes become smaller, segmenting becomes progressively more expensive and is sometimes too expensive to justify the investment. Future standards such as DOCSIS 3.1 are one way to answer the ever-growing bandwidth demands. However, moving a whole network to support the new DOCSIS 3.1 standard can be an expensive operation, because operators need to upgrade headend equipment, network equipment, passive components and even customer devices. Additionally, capacity problems are often linked with certain heavy use areas, so-called red cells. Upgrading the whole network to address just the red cell areas is a heavy investment. For networks where segmenting and large-scale upgrades are too expensive, the best alternative is a distributed architecture, where fast optical connections are brought close to the customer’s premises and distributed to individual apartments through existing cabling. Bringing fibre connections closer to consumers is a cost-effective alternative for providing high-speed broadband to the areas that need updating the most. The most cost-effective alternative for combating red cells is to use metro Ethernet for bringing connections close to consumers and coaxial cabling with DOCSIS to transport the signals inside the buildings. This combination enables operators to target network capacity upgrades to areas suffering the most from bottlenecks without needing to invest in headend CMTS. Using the familiar DOCSIS technology complements existing networks and reduces capital expenditures because current background systems can often be used for provisioning and management. Operators can avoid investing heavily in DOCSIS 3.1 or fibre networks inside buildings. Using metro Ethernet and DOCSIS also provides a clear migration path towards FttH, and fibre investments made today can be utilized in the future. Operators can easily move from this solution to full FttH in the areas or households where the consumers are willing to pay the cost. As the first manufacturer in Europe, Teleste has combined deep metro Ethernet and Data over Coax through DOCSIS into one solution. Teleste’s new DOCSIS Access Hub enables operators to deploy more capacity where it is needed the most in a cost-efficient manner. 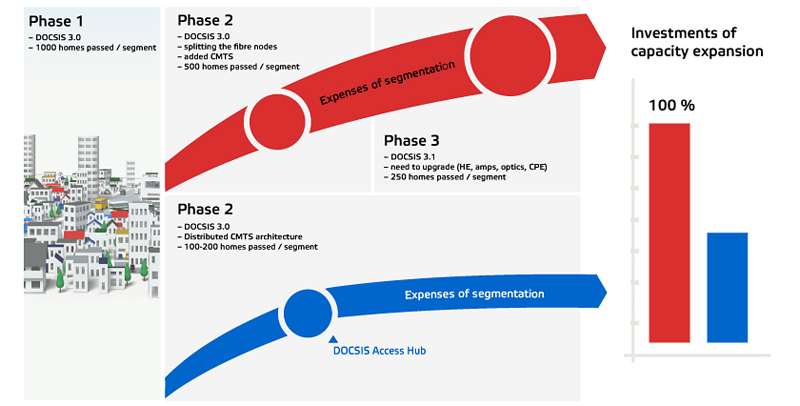 With DOCSIS Access HUB, operators can bring high-speed connections to customers at a considerably lower cost (25-50% less) compared to centralized access solutions. For small operators and hospitality solutions, the investments can be scaled down to suit a smaller subscriber base. The DOCSIS Access Hub will extend IP networks over the existing coaxial cabling inside apartment buildings. It supports DOCSIS 2.0 and 3.0 cable modems and up to 200 subscribers. Typical applications for the DOCSIS Access Hub are in FTTB/ FTTC networks and the hospitality market, e.g. hotels. The DOCSIS Access Hub makes it possible to bring the CMTS functionality closer to the customers and it also makes it possible for service providers to maximize bandwidth allocations for cable modems while minimizing system noise in the HFC network. The DOCSIS Access Hub supports a maximum of 200 households and broadband speeds of close to 1 Gbps downstream and 160 Mbps upstream, which in practice means that one hub can provide sustained high-speed broadband to an entire apartment building. By using the DOCSIS Access Hub, operators can provide subscribers with guaranteed connection speeds sufficient for even the most demanding HD video applications. In addition to solving network bottlenecks, the DOCSIS Access Hub takes the level of granularity one step further and supports individual resource allocation for each service subscriber, allowing operators to respond to specific consumer needs. 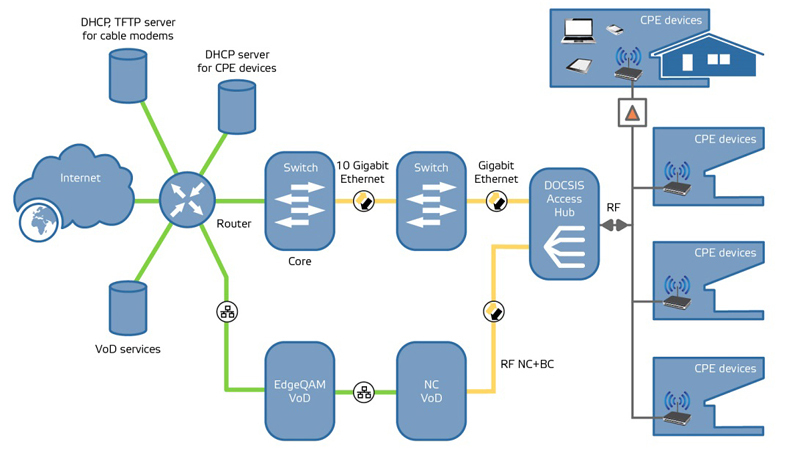 The DOCSIS Access Hub fits easily into existing HFC networks and cable operators can use existing provisioning systems. Who owns the last mile? Utilizing optical Ethernet for connections in the direction of backbone and coaxial cables with respect to last-mile connections is not limited to cable operators; in fact, it also provides the best combination of capacity and affordability for telecoms and utility operators and hospitality applications. With increasing bandwidth demands, telecom operators often struggle because ASDL/ASDL2 cannot provide sufficient speeds over large distances and VDSL technology is quite prone to errors inside old apartment networks. Coaxial cabling can prove to be the best alternative for telecom operators as well in such cases. With cable being a valuable commodity, the key question is, who currently owns the cable infrastructure within buildings and who can connect to the cabling? Within Europe, there are large differences between countries. Legislators are focusing on the issue at the moment and the EU is taking a look into whether the cabling within housing buildings could be opened up for competition throughout the European Union. Read more about DOCSIS Access Hub. The article was published on Teleste’s website.